US inflation expected to have softened in January. Wall Street soared on the back of positive US political-related headlines. 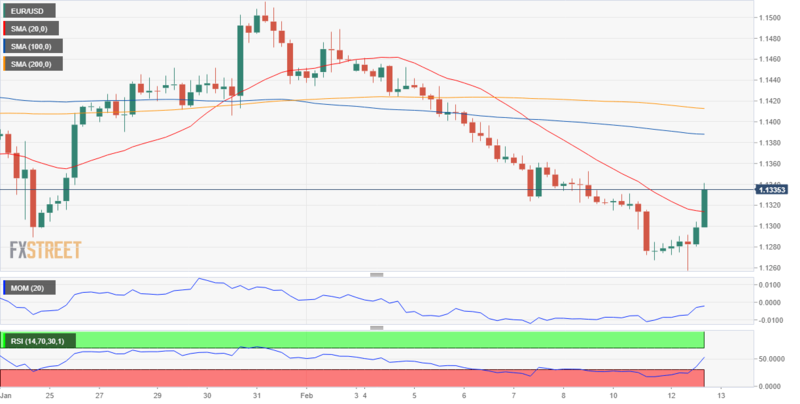 The EUR/USD pair managed to post modest daily gains after a six-day decline that extended early Tuesday to a fresh 2019 low of 1.1257. The positive momentum developed during US trading hours, as Wall Street posted an impressive advance on the back of headlines indicating that the US Congress reached an agreement about funding the government, still pending of President Trump's approval, who later said that he can't be happy or thrilled with the border deal. Other headlines showed that US-Sino that trade talks will continue this week, with Treasury Secretary Mnuchin saying that they are “looking forward to several important days of talks.” The EU didn't release relevant data, while the US offered some minor figures, with the NFIB Business Optimism Index down to 101.2 in January from 104.4 in February, and the JOLTS Job Openings for December, which beat expectations by printing 7.335M. The Fed's head Powell offered a speech not related to monetary policy, yet in the middle, he said that he doesn't think the probability of a recession is elevated, nothing that the market didn't hear before. The EU will release December Industrial Production this Wednesday, while the US will present inflation updates for January. Final yearly inflation is foreseen at 1.5% while the core reading has been forecasted at 2.1%. The EUR/USD pair advanced up to 1.1339, now holding above the 23.6% retracement of its latest daily slump, measured between 1.1488 and 1.1257. In the 4 hours chart, the price is currently advancing above a bearish 20 SMA, which maintains its bearish slope well below the larger ones. Technical indicators have bounced from near oversold levels but remain in negative ground with the Momentum actually retreating after testing its mid-line and the RSI losing upward strength at around 50. The 38.2% retracement of the same decline stands t 1.1345, providing a more relevant resistance as if the current recovery extends beyond it, it could continue up to the 1.1400 region, where the pair has the 61.8% retracement of the same slide.